One of the easiest things to do is to go to the barber’s and get a haircut. But, can you imagine a hard work day that a barber has? Attending to a queue of people waiting to have their hair done, their beards shaved or a massage is anything but easy. 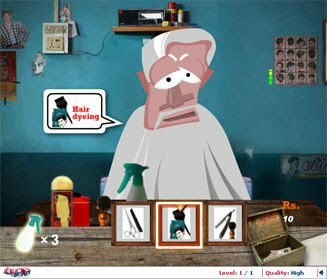 Billu’s Makeover Salon is one such popular salon, where Billu takes care of a continuous flow of customers. Slip into Billu’s shoes for a day, and experience what it takes to deal with a high-pressure job! Scroll the service panel at the bottom using arrow keys. Choose the service as Billu’s customers demand by pressing the space bar. Keep a watch on the Anger Meter!